(Phys.org)—In an effort to curb the adverse environmental impacts of paper production, researchers in a new study have developed a light-printable paper—paper that can be printed with UV light, erased by heating to 120 °C (250 °F), and rewritten more than 80 times. 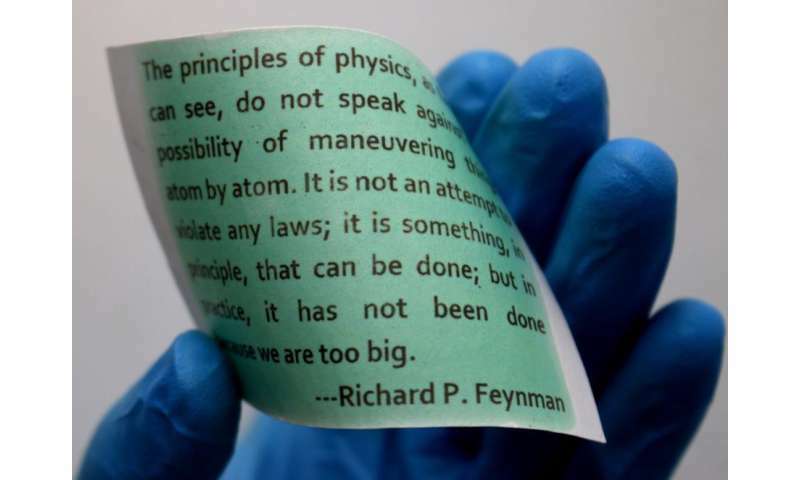 The secret to printing with light lies in the color-changing chemistry of nanoparticles, a thin coating of which can be easily applied to conventional paper to transform it into the light-printable version. 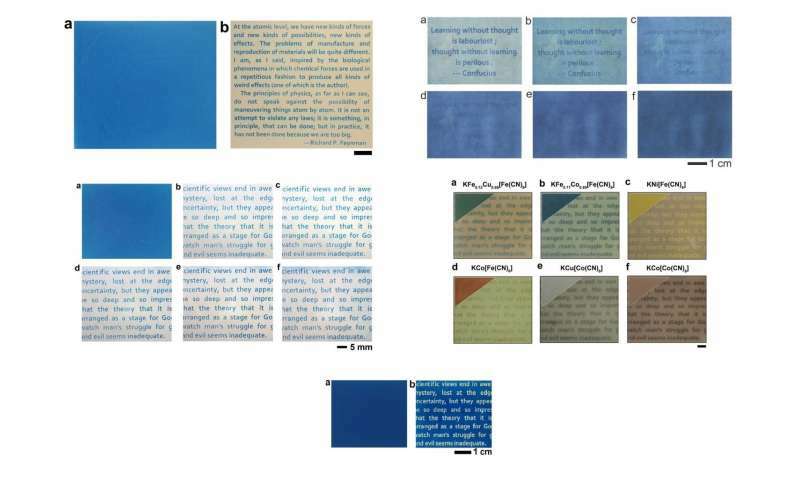 The researchers, Wenshou Wang and coauthors at Shandong University in China; the University of California, Riverside; and Lawrence Berkeley National Laboratory, have published a paper on the light-printable rewritable paper in a recent issue of Nano Letters. Currently, paper production and disposal have a large negative impact on the environment: paper production is a leading source of industrial pollution, discarded paper is a major component (approximately 40%) of landfills, and even recycling paper contributes to pollution due to the process of ink removal. There is also the issue of deforestation: in the US, about one-third of all harvested trees are used for paper and cardboard production. Working to address these problems, researchers have been investigating alternatives to disposable paper. One possibility is to take advantage of the color-switching ability of certain chemicals when exposed to light, although in the past this approach has faced challenges in terms of stability, limited reversibility, high cost, toxicity, and difficulty in applying the coating to ordinary porous paper. The light-printable paper developed in the new study improves in all of these areas, bringing the technology closer to applications, which could include any medium on which information is printed and needed for only a short time. "We believe the rewritable paper has many practical applications involving temporary information recording and reading, such as newspapers, magazines, posters, notepads, writing easels, product life indicators, oxygen sensors, and rewritable labels for various applications," Yin said. The new coating consists of two types of nanoparticles: those made of Prussian blue, which is a common inexpensive, nontoxic blue pigment that turns colorless when it gains electrons; and titanium dioxide (TiO2), a photocatalytic material that accelerates chemical reactions upon UV light exposure. When the Prussian blue and TiO2 nanoparticles are evenly mixed and coated onto paper, the plain unprinted paper appears solid blue. To print text or images, the paper is exposed to UV light, which photoexcites the TiO2 nanoparticles. These nanoparticles then release electrons that are picked up by the adjacent Prussian blue nanoparticles, which turn from blue to colorless. Since it's easier to read blue text on a colorless background than colorless text on a blue background, it's the background rather than the text that is typically printed by light, turning colorless (although the paper can also be "reverse-printed" to show colorless text on a blue background). Different colors besides blue can also be achieved by using Prussian blue analogues of various colors. Once printed, the paper retains its configuration for at least five days with high (5-µm) resolution, and then slowly fades back to solid blue through oxidation under ambient conditions. To erase the paper more quickly, the paper can be heated for about 10 minutes to return it to its solid blue state. The researchers predict that light-printable paper will be inexpensive when produced on a commercial scale. "The light-printable paper is indeed cost-competitive with conventional paper," Yin said. "The coating materials are inexpensive, and the production cost is also expected to be low as the coating can be applied to the surface of conventional paper by simple processes such as soaking or spraying. The printing process is also more cost-effective than the conventional one as no inks are needed. Most importantly, the light-printable paper can be reused over 80 times, which significantly reduces the overall cost." Future plans focus on bringing the technology closer to practical use. "Our immediate next step is to construct a laser printer to work with this rewritable paper to enable fast printing," Yin said. "We will also look into effective methods for realizing full-color printing." So all the existing newspaper and going to be recycled and printed on again, no matter how mangled they are? I think not. We are better off going all digital at this point and forgo paper all together. Why not make the sheet white and write on it with a hot-tip pen or print-head? Of course the whole ream would go blue after being unsealed (or would already be blue for not being sealed from oxidation), so a sheet would have to be blasted with UV to whiten it before writing on it. But maybe it can't get to blue fast enough to follow a pen tip. Too bad. If only the UV-to-white is fast enough, the pen would have to have a tiny UV point. And if it's too slow for that, then only photo-copy type printing would do. This was done many years ago using plastic sheets. It was the same kind of deal. They could be printed using heat (from lasers I think) and reused many times. I remember thinking it was a great idea. But it never came to be, and I later realized that the printer companies make far too much money from ink to allow anything like this to ever succeed. Yes, and like LED lightbulbs, the paper will only cost 40-100 times the price of what it is replacing.